Let’s look at the major trends impacting the social networks in 2019. In this article we are going to share our insights on the Top Five Social Media Trends for 2019! The whole world of social media is dynamic, rapidly bringing new ideas, trends and technologies into this highly competitive arena. In many cases, changes are not sudden or something which is unexpected but which evolve gradually and predictably. Not so in 2019! This year more than ever it is vital for business to stay up to date on top of the latest social media trends, adapting and making essential monthly modifications and tweaks to your marketing execution. This will enable you to keep your business online presence highly visible and engaged. Important transitions are underway! Social listening is the practice of crawling through the web and social media platforms to find mentions of your particular brand. New powerful online tools which can rapidly comb big data for insights are being employed by top brands. Today we are able to find untagged brand mentions on various social media platforms as well as industry keywords which signal buyer purchase intent for a particular product or service. This social listening trend is expected to grow this year as it starts to be utilized more for lead generation and also social selling. You may have heard of IBM’s Watson and Salesforce’s Einstein AI applications. These systems use machine learning to crawl huge quantities of customer data to identify insights, predictions and recommendations based on your business. We are beginning to see AI as a factor in social media beyond the chatbots that are being used in Facebook Messenger. AI on social media platforms can now generate emotionally targeted marketing text that delivers emotional engagement at scale and which will profoundly influence social commerce. These systems use machine learning and people’s reactions to previous campaigns to determine users’ emotional profiles. Purchase patterns, demographics and other behaviors do not impact the emotional characterization of that individual. So these systems enable marketers to break new ground in connecting emotions, emotional profiles, and user intent. Watch to see the transformations in customer service that results! Social media live streaming is growing in popularity because it adds a human touch to social posts that photos and text cannot compete with. Live Streaming is not only about live video content, people prefer to get their brand information in live video format as well. In a recent survey conducted by Vimeo and New York Magasine, 80% of respondents would rather watch live video content from a brand than read a long-form blog, and 82% prefer live video from a brand to social posts. The social media platforms are driving more revenue and engaging more users thanks to an increasing volume of live content being rolled out all the time. Live streaming can be a potent strategy for small business to reach, engage and grow their online audiences. This cohort is important for a few reasons. As today’s global youth, they number 2 billion and are on track to make up 40% of consumers by 2020. It’s time to dial them into your digital marketing strategy in 2019. We are seeing a growth in private networks, messaging channels such as Facebook Messenger and WhatsApp. In 2018 Facebook usage declined for the first time in 10 years, and this is a trend that will continue. With growing concerns over privacy, many people are sharing less on social and instead are moving to private messaging channels. This spells a huge opportunity for new sources of consumer data. Increasingly the messages we send each other are moving out of Dark Social and onto Private networks. There is a corporate monetization opportunity that is brewing as these private channels grow in popularity. Stay tuned! 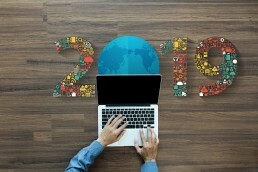 When we scan the landscape it is these top 5 social media trends in 2019 that will grow in both influence and importance. Social listening as a tactic is moving downstream and becoming accessible to smaller businesses. Artificial intelligence is playing an increasing role and bringing innovation and the power of big data into social. Live streaming over social exploded in 2018 and will continue to drive traffic and engagement in 2019. A new generation of consumers, Generation Z, are making their mark in shaping demand. And the move of messaging into private networks will bring both innovation, new tools and new monetization opportunities for forward-thinking brand. Social media marketing has become a central part of marketing your brand in today’s economy. Without question today’s consumer is searching online as a first step in almost everything we buy today. Therefore small business marketing must embrace social media, as part of an omnibus marketing strategy. Your next customer is as likely to find you online as to hear about your through word of mouth. As a leading social media agency in Toronto, we specialize in developing targeted social media campaigns designed to grow your online presence and drive new business to your website. In addition we offer a full range of digital marketing agency services including content marketing, search engine optimization, pay per click advertising, web development & design and email marketing. How might we help your business?